Rajendra Chola I (?-1044) - The Chola Dynasty was a long standing Tamil empire in southern India spanning all the way back to the 3rd century B.C. The earliest surviving references to it come from the Mauryan Empire at the time of Asoka the Great (see Asoka the Great). The Mauryan Empire conquered almost the entire Indian subcontinent with the exception of the southernmost region, where the Chola survived Mauryan expansion. However, it didn't become a noteworthy empire until about the 11th century A.D.. At that time one of India's greatest military warlords rose to power. His name was Rajendra Chola I. 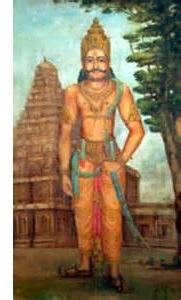 He was the son of Rajaraja Chola I, who ruled from 985 until his death in 1014. Rajaraja put the Chola Dynasty on the path to empire. By the time Rajendra became emperor, the Chola had become the most powerful kingdom in India. Almost nothing is known about him before his rule. But once in power, Rajendra's reign was dominated by military conquest. He extended the Chola Empire north to the Ganges River. He is also one of the few rulers who pushed the borders of his empire beyond India, incorporating Ceylon (modern Sri Lanka) and much of Indonesia into its realm. Although he did not conquer Thailand and Cambodia, he exacted tribute from their ruling kingdoms. Rajendra built one of the most powerful empires in the world in his lifetime.